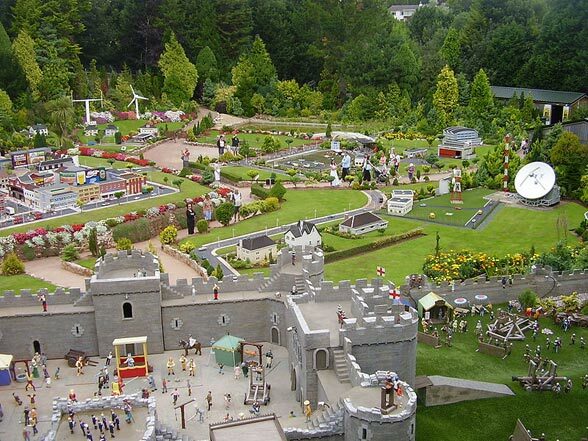 Set in four acres of beautifully landscaped grounds in Babbacombe, a district of Torquay in Devon is a model village that’s sure to keep young visitors and adults entertained for hours. The Babbacombe Model Village has more than 400 models, along with a model train track that is more than 1,000 ft (300 m) long. Opened in 1963, Babbacombe Model Village was the labour of love of Thomas Ernest Dobbins, a man who devoted 50 years to creating this extraordinary village . Thomas Dobbins was well-qualified to build this model village. He was a Lancastrian architect from Torquay and his famous model village was carefully created at 1/12 of its original scale. Through the miniature buildings, people and vehicles, visitors to Babbacombe Model Village can experience the essence of England in the past, present and future. You can explore the miniature representations from Stonehenge, see the range of housing from labourers’ thatched cottages to Tudor merchant houses on narrow, cobbled streets to Georgian manor houses set in sculpted parkland. Then, there’s the classic vintage ‘O’ Gauge model railway. Babbacombe Model Village not only faithfully recreates the people and architecture, but also replicates the open moorland, intricate coastline and steep valleys of the West Country. Babbacombe’s garden settings provide a stunning backdrop for the hundreds of miniature models. And, things don’t just stand still at Babbacombe: In summer, the grounds are covered with glorious flower blooms putting Babbacombe up on the scale as one of Europe’s premier model villages. Between May and September, you can visit after dark, when every little house is illuminated. During these months there is also a complimentary old-fashioned, Edwardian bus which transports visitors to the village from the waterfront, via the pretty coastal road. At Halloween, the village takes on a spooky air and in winter, the place transforms into a snow-covered Winter Wonderland with special visits by Santa Claus to boot. Not everything is small at Babbacombe. The Model Village has acquired a Wollemi Pine, which is one of the world’s oldest and rarest tree species from a 200 million-year-old-plant family. In the 4D Theatre, visitors can come face to face with dinosaurs and other weird and wonderful sights or be terrified by Dracula. Plan on a visit of 2-3 hours as there’s a lot to see and enjoy at Babbacombe Model Village. Your entry ticket is valid for the whole day and it is recommended that visitors return in the evening to see the night illuminations. Babbacombe Model Village is just 3 minutes walk from the St. Marychurch bus stops and from here there are buses to Torquay Harbour, Teignmouth, Dawlish, Exeter, Totnes and Paignton Zoo.